Welcome to Easy Profile Picture Maker. 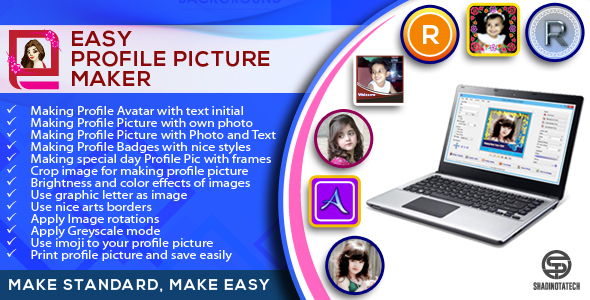 This software may you help to easily make your profile picture nicely. Also Easy Profile Picture Maker is user friendly and too easy to use. It has a lot of useful features, which is extremely easy to use. Do not spend your time to make Profile Picture and Profile Avatar. This is a very essential program for making Profile Images. The interface of this program is very attractive to see which you will be able to use. The project is written in vb.net 2010. Contents- Text Only, Photo Only, Text & Photo, Badge. Save as image in PNG etc. Making Profile Picture with nice template. Can you add your own template to use. Print profile picture and save easily. If you need any help using the application or need special customizing please feel free to contact me via my codecanyon profile. If you have a moment, please rate this item, I’ll appreciate it very much!…. This entry was posted in images-and-media, net and tagged apps, avatar, badge, easy edit, easy maker, image, initials, mockup, photo frame, profile, profile picture maker, social media, software, text by dadmin. Bookmark the permalink.